in Front End, Livecoding, Technical. 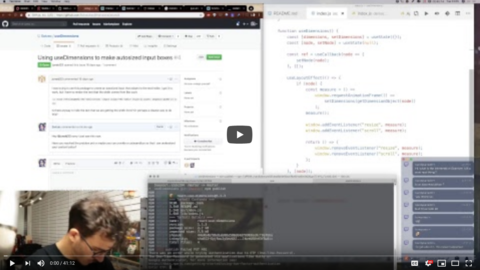 Swizec Teller published on April 3, 2019 in Front End, Livecoding, Technical. It’s not perfect, but that highlight is a hole punched through a darkened canvas. It uses useDimensions for positioning and needs to update when you scroll. We use a useLayoutEffect to run our code synchronously on DOM updates. Inside, we check that the node exists, then create a debounced measure() function. 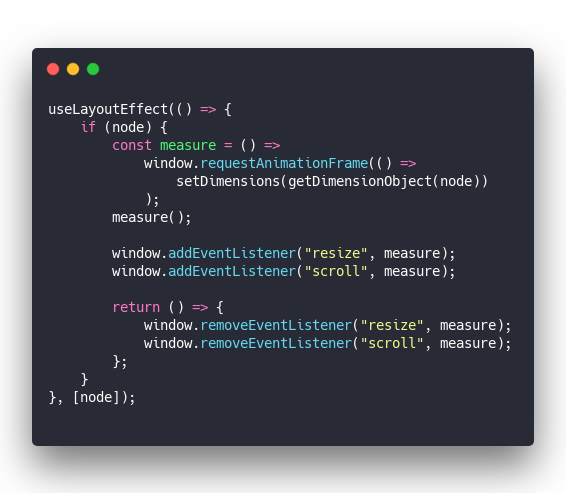 Measure runs on requestAnimationFrame so we don’t kill the browser even if the code falls into an infinite loop. You might get small subpixel resizes forever because of layouting edge cases. I’ve seen it happen. It’s bad. getDimensionObject gets measurements, setDimensions is the state setter from a useState hook. You can see full code here. Window resize and scroll listeners will re-run our measure() function when things change. Scrolling will change its position, resizing might change its dimensions. There’s a problem here 👉 if the container resizes and the window doesn’t, we’ll have stale dimensions. After some research I realized I was wrong. IntersectionObserver doesn’t do what I thought it does, but it’s super neat anyway. You want to use the IntersectionObserver API when you have two DOM nodes and you want to know when their intersection changes. It’s all in the name right? A common use-case is something like my react-lazyload-fadein library where you want to lazy load images juuuuust before they become visible. You could create a new intersection observer between the document and your placeholder node and wait for notifications. Super neat, not what’s going to fix our resize edge case. 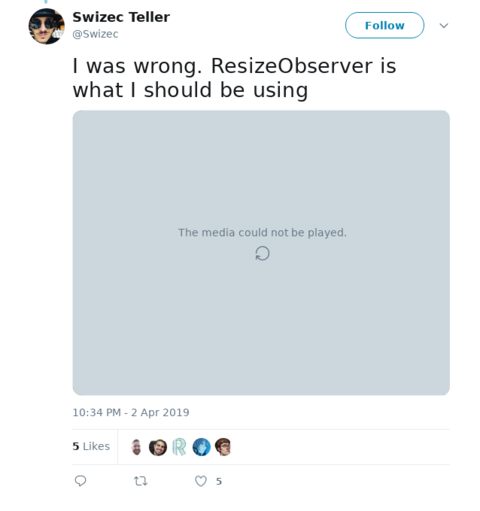 ResizeObserver is an even newer API. Mozilla calls it “experimental”. Support is lacking, but there are polyfills you can use. 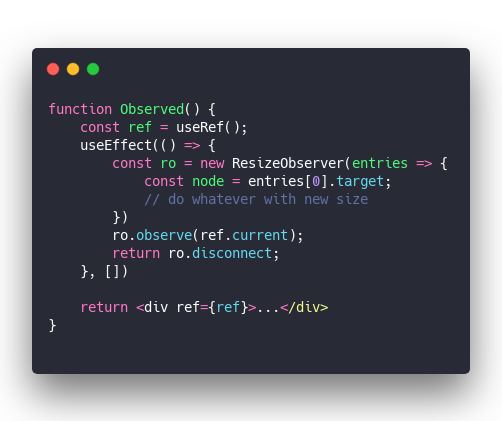 The idea here is that you can create a new observer object, give it a DOM node to observe and it’s going to call your function when something changes. You can give it multiple nodes too. Create a new ResizeObserver in an effect post initial mount. Give it a method that runs when the observer fires, make it observe your React element, return the disconnect function to clean up on unmount. Except it doesn’t work. You can see it in the stream around the 29 minute mark. ResizeObserver was going crazy and firing as fast as we could read. Remember when I said you can run into subtle layouting edge cases where things are unstable and resize very often? That. So we gave up, reverted back to window.addEventListener, and left the edge case alone. Pretend like none of this ever happened.